VisionTek VT70 USB 3.0 to DisplayPort Adapter - External video adapter - USB 3.0 - DisplayPortThe VisionTek USB 3.0 to DisplayPort adapter allows for additional displays with compatible USB 3.0 devices. With this plug-and-play adapter, you can easily increase your desktop workspace to increase productivity. Able to support individual or cloned screens, take your desktop to the next level in visual real estate. Ideal for professionals needing to expand their workspace or laptop users who just need that extra screen, no additional graphics or drivers are needed. The USB 3.0 to DisplayPort adapter is powered by the USB 3.0 port on your system and requires no additional power. 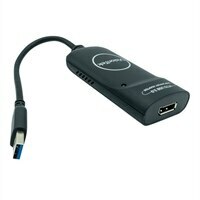 The VisionTek USB 3.0 to DisplayPort adapter allows for additional displays with compatible USB 3.0 devices. With this plug-and-play adapter, you can easily increase your desktop workspace to increase productivity. Able to support individual or cloned screens, take your desktop to the next level in visual real estate. Ideal for professionals needing to expand their workspace or laptop users who just need that extra screen, no additional graphics or drivers are needed. The USB 3.0 to DisplayPort adapter is powered by the USB 3.0 port on your system and requires no additional power.